When planning a wedding, the bride has a very long list of to-dos. And, for the busy bride, sometimes it can all be a bit overwhelming! However, there is one very fun task that you get to do as a bride, and that is thanking the girls who will be by your side on your big day. Shopping for bridesmaid gifts is a task you should definitely not delegate. Why? This is one occasion where purchasing one for yourself is perfectly acceptable AND encouraged. Plus, who better to find gifts that your bridesmaids will love other than you? But, we know you are busy and stressed, so in efforts to be as helpful as possible, we've put together a list of bridesmaid gift ideas that your bridesmaids will LOVE. What girl doesn't love a monogrammed gift? These jewelry dishes are the perfect gift for your bridesmaids as they are fun, colorful and the best part? Practical! She'll love it... because its actually useful and reflects her unique personality. You'll love it... because at $14, the price won't break the bank, even with large bridal parties! Your bridesmaids will need something to tote around all of their makeup, accessories, shoes, champagne, etc. on your big day. Why not get them a cute, calligraphy tote bag showing them how much you love them? She'll love it... because she can keep everything in one place. You'll love it... because it fits with your unique sense of style. Plus, at $10 each, the price doesn't hurt either. 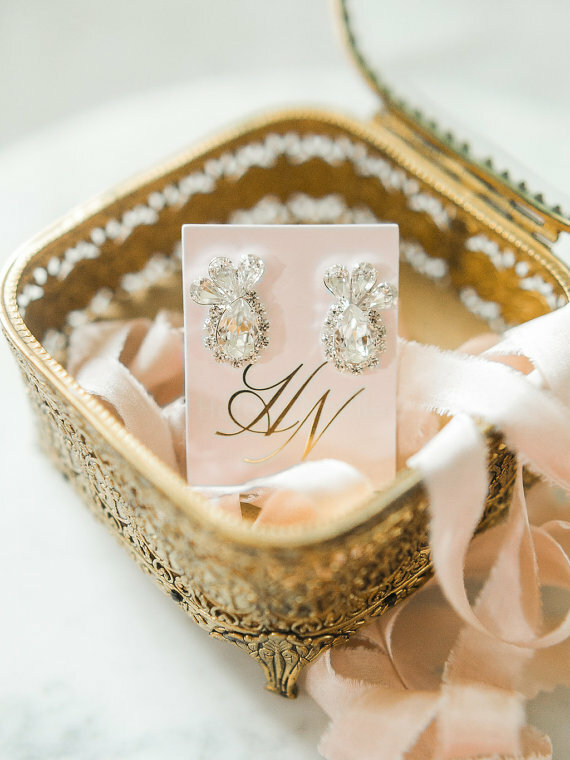 Jewelry is a common gift for bridesmaids. But, why not up the ante on the traditional bulk jewelry purchase and go handmade, and local. Helena Noelle Couture is located right here in Richmond and offers the most stunning jewelry, bridal belts and headpieces for the bride who wants something to make a statement. She'll love it... because its handmade and GORGEOUS! You'll love it... because your girls will be stunning on your wedding day. While getting ready robes are nothing new, you may not have heard of Plum Pretty Sugar. They have robe sets for your bridesmaids in soft, comfy fabrics that your maids will be more than happy to wear again and again. She'll love it... because she can wear it again and again. You'll love it... because of the gorgeous getting ready photos you'll have with your maids! Have any other ideas to add to our list? We hope we shared a bit of unique inspiration for gifts for your bridesmaids. Did you know that we also offer space in our manor house for bridal showers? Let your bridesmaids know that we can help them host a southern bridal shower that will be the talk of the town. Request information on our availability and pricing today. Love is in the air as Valentine's Day approaches in February. While Valentine's Day in Virginia is typically during the off season due to the winter months, there are plenty of reasons to consider a wedding on the most romantic day of the year. The possibilities of snowy backdrops, a hot chocolate bar and the possibility of cheaper rates from vendors during their typical slow season. Or, perhaps Valentine's Day has always held a special meaning to you and your significant other. Whatever the reason, we thought we would pull together a few inspiration boards with various color palettes that include both the traditional and slightly updated Valentine's Day wedding inspiration. Enjoy! While red and pink may be the traditional color combination for Valentine's Day, this modern and sophisticated update of Red, Pink and Gold is far from expected. Rich, bold florals come together to set the stage for an amazing seasonal celebration. And seriously, gold leaf detail on the cake? We swoon! A much softer and modern color palette choice, soft pink and cool grey is the perfect ultra chic color combination for a more sophisticated couple into clean lines. Add a blush wedding gown and soft, flowing bridesmaids dresses for a touch of elegance and romance to your Valentine's Day wedding. What could possibly be more bold than a black wedding dress? Although not traditional, take classic black and add in blush pink and a touch of gold and you have a classic palette that is sure to remain timelessly in vogue. We just love the stark black contrast against the soft blush. Pure perfection! Are you considering a Winter or Valentine's Day Wedding? Dellwood Plantation offers everything you need to have the wedding of your dreams - no matter the season! Contact us today to schedule a tour to see the beauty of the plantation in all seasons. Yes, we did it, we said the "B" word. And while its not THAT "B" word, some feel that a wedding budget is a bad word during the wedding planning process. However, when it comes to planning your wedding, you need to embrace your budget. Why? According to Borrowed and Blue, the average cost of a wedding in Richmond is $31,000, so you'll want to manage your budget and spending accordingly to stay sane during the planning process. Knowing that it can be difficult to discuss money, we've put together our top 5 tips to set and most importantly, KEEP, your wedding budget. If you and your fiancé are funding the entire wedding yourself, take a look at your current financial situation to determine what you can realistically afford for your wedding. If parents or other family are helping to finance the wedding, be sure to have a frank discussion about the budget and any expectations for the wedding. Nothing has a greater impact on your total budget like guest count. Why? Well, for starters, the bigger the guest count, the bigger the budget. All catering, plus cake, is all charged at a per person rate. And, only certain venues offer space for up to 250 guests, so you'll want to make sure you think through how many second cousins you put on the guest list. 3. Determine Your "Must Haves"
Once you've determined the amount you have for your wedding, the next step is to think about the "must-have" items on your list. Are you and your fiancé serious foodies? Have your eye on a couture wedding dress? Have you dreamt of a 7-tired cake confection? The items that are important to you and your fiancé should be appropriately prioritized within your wedding budget. Unless you are 100% set on a specific date, consider shopping for dates in what's typically considered the "off season" for many venues and vendors. The off season here on the east coast is typically January-March, with some dates in November, December and April that can be lower cost than the typical wedding season of May-October. There can be a lot of beauty in a winter wedding - just check out our winter wedding post for lots of great inspiration. It doesn't take more than a 5 minute look at "wedding inspiration" on Pinterest to see how easy it is to get caught up in all of the beauty available. Setting a realistic budget is the first step to keeping it. The most important thing to keep in mind when planning your wedding is to remember what's absolutely needed to have the wedding of your dreams - not someone else's. Resist the urge to splurge on extras that no one will notice but you, and instead, spend time investing on a once-in-a-lifetime experience you and your fiancé will always remember, rather than remembering the debt and/or stress for the fancy getaway car or custom ice sculpture. At Dellwood, we offer a variety of packages and pricing options to meet the needs of any wedding celebration and budget. Request information today and we'll send you our latest packages and availability. Choosing your wedding venue is almost just as important as choosing the person you are going to marry. When you stop to think about it, your wedding venue is the place where you will say your vows and pledge to be husband and wife if you are not to be married in a church. Even if your ceremony will take place at a church or place of worship, your venue will be the place of the celebration of your new union with family and friends. Because choosing a wedding venue is an important decision, you'll want to be prepared with questions for when you tour the location. However, before we get to the questions to ask on a tour, here are a few questions to discuss with your fiancé prior to choosing venues to tour. What city do we want to get married? Do we want our wedding ceremony in a church or place of worship? Do we want our wedding ceremony outside or inside? What type of place do we want our ceremony and/or reception, i.e. a vineyard, plantation, hotel or barn? Do we want our reception in a ballroom, under a tent or open air outside? How many guests do we expect? What is our budget for the venue? Once you've answered the above questions, you are ready to schedule wedding venue tours. You'll want to be sure that you tour venues that meet the requirements from the discussions with your Fiancé or your parents if they are also helping to pay for some of the wedding costs. Why? You'll want to be sure that you only tour venues that are true possibilities and fit your budget. Keeping all of your criteria in mind, here's a list of additional questions you'll want to ask while on your venue tour. Is the venue available on the date(s) we are interested? What is the cost for the venue on those dates? Does the venue offer different prices and/or packages for different days of the week? What amenities are included with the venue fees? Are there any additional requirements of the venue? Is a security deposit required? If so, how much? How is it returned? Does the venue have a preferred vendor list and/or require use of an in-house caterer? How many hours are included in the venue rental? What additional rentals are required for the venue (ie. tables, chairs, etc.)? Is a tent rental required? If outdoors, what is the rain plan alternative? Is parking free and readily available? Does the venue provide parking attendants? Is there a bridal suite available? What time is the room available the day of the wedding? Will we be allowed early access to the venue to decorate? Does the venue offer a day-of-wedding coordinator or a facilities coordinator? Do I have to acquire my own ABC license to serve alcoholic beverages? Can we bring our own alcohol to the event? If so, does the venue offer a bartender? Do we have exclusive use of the property on the day of our wedding? What time of day can we start our wedding ceremony and/or reception? What time does the wedding reception have to end? Are there any local noise ordinances we should be aware of for music to end by? Does the venue offer overnight accommodations? How close is the nearest hotel for out of town guests? Does the venue offer a walk-through with the caterer and other key wedding vendors? If so, when is that typically scheduled? If we are interested in booking, what type of deposit is required to hold the venue for our date? We hope that the above questions will be helpful to you as you tour potential wedding venues for your big day! At Dellwood, we provide exceptional value to all of our couples. While most venues only offer an empty space, we provide a tent, tables, chairs and bridal suite with every package. Schedule a tour today - we'd be happy to answer all of your questions! Congratulations to all of the newly engaged couples! The holiday season is a busy one for engagements. In fact, according to WeddingWire, over 30% of all engagements occur November through January. We understand that starting to plan a wedding can be a very overwhelming task - and it can be difficult to know where to begin. So, that's why we thought we'd pull together the best wedding websites out there for wedding planning advice for brides to be so you can find a great place to start planning the wedding of your dreams. WeddingWire is a one-stop-shop for brides to be! This easy to use and navigate website includes helpful features including a master wedding checklist, budget tracker, guest list manager, plus lots of inspiration from real weddings. Brides can also search for reputable, local wedding vendors to pull together a dream team for your wedding. Bonus Feature: The Hashtag Generator! Add in all of the pertinent information and hit submit to get your personalized wedding hashtag - a must for today's social savvy brides. Just like their website says, you can truly plan your wedding from start to finish using TheKnot.com. They have a wedding checklist, budget planner tool, free wedding websites and a mobile app to help with planning on the go. You can also find local wedding vendors along with reviews from real brides. Plus, they also have a very informative blog (although not much to look at) with valuable information such as Engagement Ring Insurance and answers to common etiquette questions. Bonus Feature: Sign up for local offers and receive emails from local wedding vendors with special offers and discounts on services. For local Richmond brides, Borrowed & Blue is an excellent resource for local vendors. In addition, they focus content on real weddings held right here in Richmond to give inspiration and help you find the right vendors to pull of your unique vision. Bonus Feature: Sign up for their email list to get planning emails customized to you and your wedding date! If you are looking for mostly inspiration with a side of helpful, Style Me Pretty is an absolute must for this list of the best wedding websites. Style Me Pretty includes daily posts of inspiration from classic to modern and romanic to vintage - and everything in between for the modern bride to be. Bonus Feature: The Vault! Think of Pinterest with only the most beautifully curated wedding inspiration photos and the vendors that made them possible. A new trend is emerging with weddings - intimate weddings of 75 guests or less. Couples looking for an intimate gathering with family and close friends are opting for smaller affairs. Intimate Weddings is the source for inspiration, venues, DIY projects and real wedding inspiration for brides to plan the intimate wedding that fits your vision. 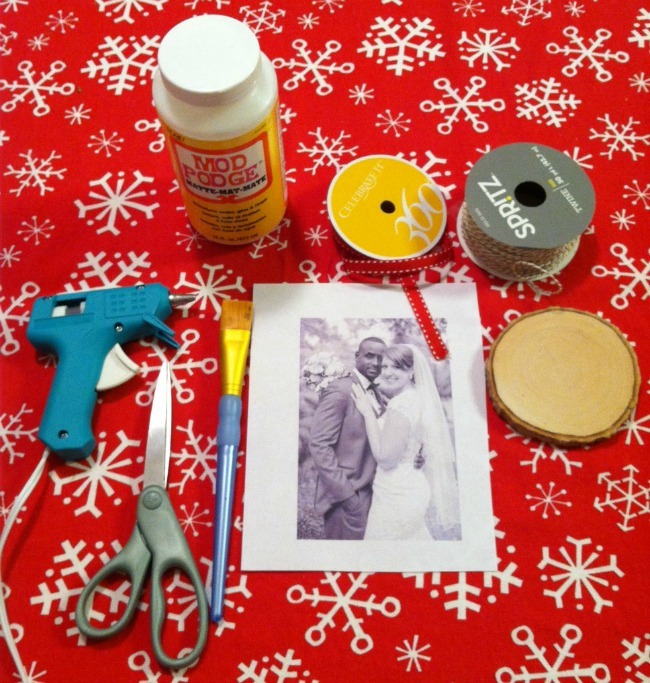 Bonus Feature: The DIY project gallery features hundreds of projects and tutorials for the do-it-herself bride. Do you have any other wedding websites to add to our best list? Let us know in the comments! Crystal and Jeff had the most beautiful day this past Spring for their wedding here at Dellwood. The sun was shining and the trees were full of green on the plantation as these two said their vows and became man and wife! We just love their unique sense of style and how beautifully all of the details came together - just wait until you see the beautiful bride! 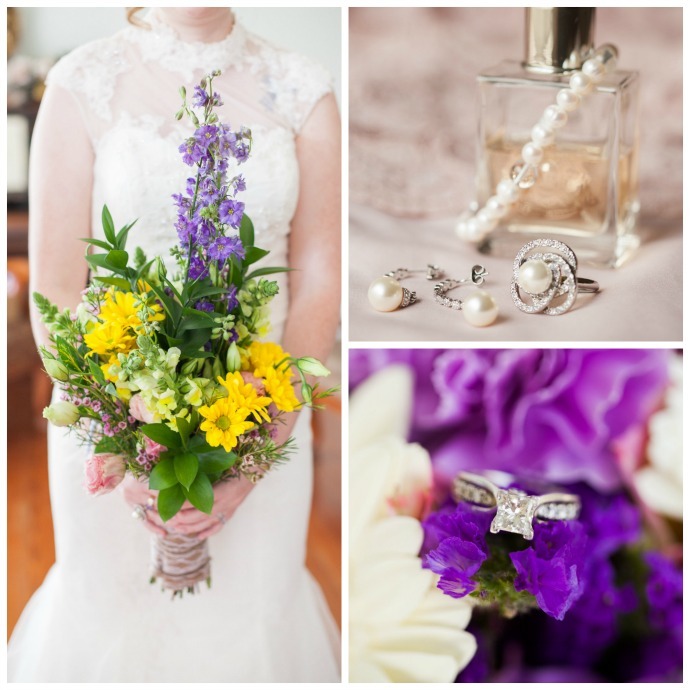 You're just going to love these gorgeous images by Anna Filly Photography. Enjoy! Congratulations you two! We're honored you chose Dellwood Plantation for your wedding. We wish you many years of joy and happiness together! Traditionally, here in Virginia, winter is a time of year that is often overlooked for weddings. However, as the weather has shown so far this December, the weather can often be just as mild as the fall and can create unique opportunities to create a beautiful wedding. Plus, since it is often the off season for venues and vendors, you can often snag a discounted rate and negotiate on pricing that can have a big impact on your overall budget. So, for brides looking for a few reasons to consider a winter wedding, we've pulled together some stunning inspiration to get the creative juices flowing for winter weddings. Fall isn't the only season in which jewel tones can really shine - winter is also the perfect time to use jewel tones to your wedding day. Plus, different tones such as deep amethyst, burgundy and cranberry are the perfect cure for the traditional winter blues and provide a great deal of warmth to your wedding. Winter is a great time to incorporate natural elements, such as evergreens, greenery, twigs, cranberries and pinecones. All of these items are readily available during the winter months and provide a great natural touch to all sorts of items including table decor, florals and even your cake. Plaid is a common pattern and texture to think about for winter, but maybe not something you have thought about for your wedding. However, you shouldn't shy away from plaid - as it is a great way to add a winter twist to a rustic themed wedding. Plus, plaid can be used as a great accent color/pattern instead of traditional wedding colors to be used to add a "touch of plaid" or as a strong visual element as the shirts for the groom and groomsmen. Seriously, how amazing and romantic are these photos in the snow?! You can't get photos like this in any other season. And, if you don't have snow near you in the winter, you can always have a reverse destination wedding to a cozy mountain town and enjoy everything the season has to offer. Are you planning a winter wedding? Find more inspiration on our Winter Wedding Pinterest board. When planning a wedding yourself, it is easy to overlook the tiny details of your wedding day. Sure, you've got the big things down like ceremony start time and when its time to start getting your hair and make-up done, but what about what time does the photographer need to arrive prior to the ceremony based on the length of your contract? So, in an effort to help DIY brides, we've pulled together a list of questions to help you start to pull together a day-of timeline for your wedding to ensure all things go smoothly. What time can you have access to the venue for decorating? Some venues, such as wineries and other locations, have reception start times for a reason, as they have other customers there during the day. Be sure to check on how early you can arrive to decorate and/or gain access for the caterer and florist to begin set-up. Who will be setting up items such as the guest book, favors, table decor, etc.? If you have a day-of wedding coordinator, this will fall under their responsibilities. However, you might have a friend or family member (it might even be your Mom) who will be responsible for setting up small details at the venue. Be sure to plan plenty of time for that person to be able to complete set-up and get ready for the wedding. Will you be getting ready there? What time can you arrive? If your ceremony and reception are at the same venue, chances are you may be getting ready there. If so, you can probably gain access to the bridal suite hours before your ceremony starts. Be sure to check on that time and coordinate with your hair and make-up person so things go as planned. If you are not getting ready at the venue, how will you and the bridal party get to the venue? Sometimes, you may choose to get ready at home or at a hotel suite for everyone to be together. If so, you'll need to plan for transportation for you and the bridal party to get to the venue. You may want to call a car or limo service to make things easier and have extra space, especially considering you'll be in your dress. If your ceremony is at a church, what time does the ceremony start? Who is responsible for decorations at the church? Some churches have a coordinator to help, however, you will most likely have to designate someone to ensure flowers, programs, etc. are in the right places. How long do you have the venue for in your contract? Typical contract length is 4 hours for the reception, 5 hours for ceremony and reception if both are held in the same place. Based on your timeline, you might also want to consider if you need another hour at the venue and potentially plan for an additional charge. What time will the florist be delivering the flowers to the church and/or venue? One common item most brides forget is to have their bouquets delivered to the location where you are getting ready to have them with you for pre-ceremony photos, your first look if you are doing one, etc. What time is the cake being delivered to the venue? Most times you'll get a window, so you'll want to be sure someone will be at the venue for them to get in. How long have you contracted your photographer? Based on the length of time, be sure to plan for the photographer to arrive in plenty of time to take pre-ceremony getting ready photos and then stay to the end, especially if you have a special exit planned. How early will the caterer need to arrive? Be sure to coordinate with the venue to be sure someone will be there and the caterer can gain access at the appropriate time to begin set-up. What music will be playing during the various parts of the ceremony and reception? Processional - Seating of the grandparents and parents, groom's entrance, and bridesmaids entrance. This can be the same song or different songs. Bridal Processional - The song for the bride to come down the aisle. Recessional - The song for the bride and groom to walk back down the aisle as husband and wife. Ceremony Entrance Music - The song for everyone to be announced at the reception. First Dance - The song to play during your first dance as husband and wife. Father-Daughter Dance/Mother-Son Dance - Songs to play during the special dances at the reception. How long will you take photos after the ceremony? Work with your photographer on how much time he or she needs to take the formal family photos and your portraits after the ceremony prior to the reception. This is why most couples plan a cocktail hour to get guests into the celebration while waiting for the bride and groom to take photos. What is the order of events at the reception? Once you are announced, do you want to do your first dance right away or do you want to start eating? When will you cut the cake and do toasts? What time will you plan your exit to ensure guests are still there? Who will be responsible for gathering gifts and any remaining decor items? Most venues require that all personal items are removed and that the venue is fully cleaned at the end of the night. You and your groom will be long gone after your planned exit, so be sure to plan for someone to gather gifts, all remaining decor items, any remaining items from the bridal suite, etc. Whew! We know that is a lot to think about, however, those details are the important details to think about ahead of time to ensure that your wedding day runs smoothly and you can enjoy the party that you've spent months planning - rather than answering questions on the fly during the event. 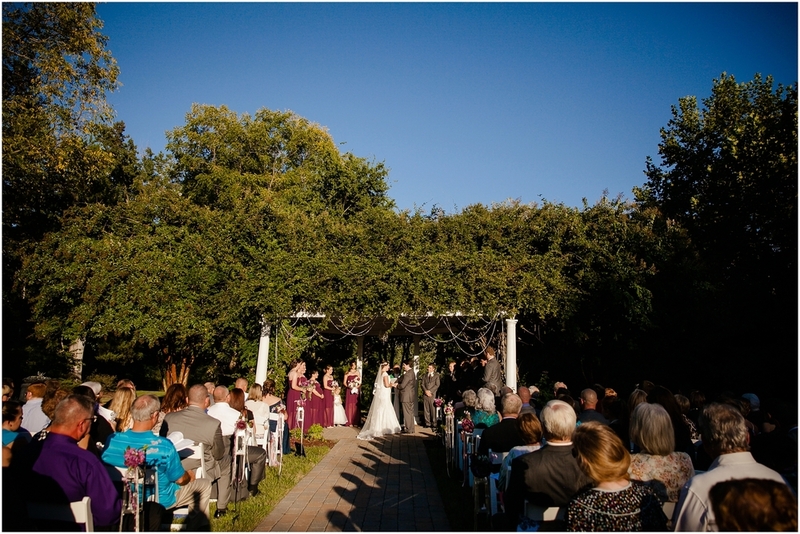 At Dellwood Plantation, we have over 15 years of experience running smooth weddings. All of our packages come with a mistress of ceremonies to ensure that your wedding will run smoothly once you start your walk down the aisle to your new husband. We invite you visit the plantation and learn more about our comprehensive wedding packages. Hillary and Chris were married on a beautiful late October day at Dellwood Plantation. The sun was was shining and the weather was absolutely beautiful as they said their vows in front of family and friends. Their wedding was full of so much joy and laughter, sweet DIY touches and a fire pit complete with S'moores. Kathryn Ivy Photography shared these gorgeous photos that captured the happiness and love that Hillary and Chris shared on their wedding day. Enjoy! We couldn't be happier for Hillary and Chris. We hope you both enjoy many years of joy, love and happiness. All photos courtesy of Kathryn Ivy Photography. Brandt and Justin had a wonderful wedding day filled with so much joy and laughter that a little bit of rain wasn't going to dampen their spirits on their big day. While planning an outdoor wedding you hope for sunny blue skies, sometimes mother nature doesn't always cooperate. And that's why we just love these photos from Photography by Nicole Johnson - you can see that Brandt and Justin had the most beautiful wedding day despite a bit of rain. Enjoy! Brandt and Justin, we wish you many years of happiness in your future together as husband and wife! In our last post, we shared unique wedding favor ideas to consider as you plan your wedding. Today, we're here to share a few creative ideas for alternatives to the traditional wedding guest book. While the traditional guest book may work for some folks, many new and creative options are now available for couples to incorporate their unique style and create a true wedding keepsake - rather than just putting another book on a shelf. With all of the wedding guest book alternatives to consider, we pulled together a list of our top picks to inspire you that will work with any theme or budget. Having a travel theme wedding? Love to travel? Hope to have a marriage full of adventure? Then this gorgeous, hand-painted vintage globe would be perfect for your wedding guest book. Grab a few gold metallic sharpie pens and guests signatures will compliment the globe perfectly. Not only will it serve as an amazing detail on your wedding day, but it will continue to be a conversation piece proudly displayed in your home for years to come. Bonus: Add decorative pins every time you and your husband travel to new places. You can purchase one for your wedding at PrettyLittleDooDads on Etsy. There are so many ways to utilize photos for a unique and fun wedding guest book. You can buy an Intax Camera and film for guests to capture a hard copy selfie to put in a book with a fun message. Or, you can create a personalized guest book with photos from your engagement session on Shutterfly. That way you can create an album of engagement photos to enjoy next to messages from your friends and family. There are so many decorative guest book options to create a memorable and unique guest book that you will proudly display in your new home. This anchor is perfect for a nautical themed wedding or a couple that loves the open seas. Other options include a wooden initial or plank board for guest signatures. Wrap yourself in the warm messages from your family and friends with a guest book quilt. There are many ways to display the quilt at the reception. You can display individual blocks for the complete quilt. Plus, you can utilize fabrics in colors that compliment your wedding colors and theme. Need more inspiration? You can see more unique guest book ideas on our Pinterest Board. What are your favorite wedding guest book alternatives? What unique ideas have you seen? Share them in the comments - we'd love to hear your thoughts! Wedding favors are a highly debated item when it comes to planning a wedding. However, since the sixteenth century, couples have been giving gifts to wedding guests as a gesture of gratitude for sharing the beginning of their new life together. Today, there are so many unique ideas for wedding favors to fit with any theme and budget. We've pulled together a few fun ideas for wedding favors that your guests will love - that won't break your budget! You can't go wrong with edible wedding favors. Providing a treat to guests will always be appreciated and enjoyed. You can go personal and provide your Grandmother's recipe for strawberry jam (with the secret ingredient she won't give up!) or share your favorite flavor of gourmet popcorn from the place you went on your first date. It doesn't have to be too meaningful - it can be your favorite food or sweet treat too. Bonus for edible favors - guests will extra love it as edible treats won't end up catching dust on a shelf or taking up space in a kitchen drawer. Environmentally friendly wedding favors provide a win/win for couples - they are generally inexpensive and they don't create needless waste. Plus, they are very cute and your guests will appreciate your thoughtfulness. Bonus - how cute are these two options?! Who wouldn't want a heart birdseed feeder or an adorable succulent plant?! There are many favor ideas that fall into the useful accessories category - these items can also be thought of as keepsakes or souvenir from the event. These can be personalized to match your event to either be used at the event or in the future - your guests always remembering your special day. Most favors are designed with a particular theme or season in mind - and the above ideas are meant to go along with a winter-themed wedding. Can't you just imagine the snow lightly falling, guests wrapped in a warm fleece blanket next to a crackling fire eating a s'more? No? Just us? You get the idea! Themed favors can be pulled together to compliment every season and setting. Need more inspiration? We've created a Pinterest Board with a bunch of favor ideas - plus lots of other ideas as you plan your wedding. Do you have any favor ideas to share? What did you give your guests or are you planning to give as a favor? We'd love to hear it in the comments below! Congratulations! You’re engaged! Now that you’ve got the guy and the ring, along with the congratulations from family and friends you’ll start to get asked, “So, when’s the big day?” While you should take a moment to bask in the joy of the moment, you’ll quickly want to transition into wedding planning mode so all of the important people in your life can start planning and making arrangements. So, where do you start? Here’s a list of the first things you should do when planning a wedding. Yes, this is number one! Once you start planning, there will be plenty of time for coordinating and stressing about the details, however, its really important to enjoy being engaged too. Be sure to take the time to enjoy this season of your life and focus on what’s important, your marriage and the life the two of you are starting together! Prior to discussing with both of your parents, you and your fiancé should discuss the type of wedding you want to have – big or small, just close family or second cousins too. Once you have an idea of the type of wedding you want to have, discuss budget and expectations with both sets of parents to get everyone on the same page. Having a budget and guest count is important when starting to reach out to all of your important vendors including venue, caterer, cake, etc. Once you have a budget and a guest count, you can start to research and schedule visits with venues in and near your desired location for your wedding. Based on your guest count, many venues offer various pricing options or rooms to accommodate the needs of your wedding. When reaching out to a venue to ask for information, include your guest count along with a tentative date, month or time of year. Be as specific as possible, however, it’s not necessary to have a specific date picked out. Venues will respond with packages and pricing for the time of year and let you know their available dates. Prior to booking, take a tour to ensure that it meets your vision and be sure to get all of your questions answered. Once you tour venues and find the right place, book it! Its important to book your venue first to lock in your date and begin to build the rest of your wedding around the venue. Your wedding venue will have an impact on every other decision you’ll make. Don’t believe us? If your wedding is at the beach, the type of dress you wear, the flowers you select and food you eat may be different than if you choose a ballroom downtown. However, booking your venue is the first important decision you will make that requires a deposit, so you’ll want to be sure you’re certain. Once you have your venue booked and a date in place, you can start contacting other vendors to ensure their availability. Many venues have a preferred caterer list that is approved to provide food at the venue, so you’ll want to start with that list if required. Plus, you can schedule engagement photos (perhaps at your venue!) and start to design save the dates to get your special date on the calendar for loved ones. There will be plenty of decisions to make when you start planning your wedding, and everything can quickly become overwhelming. However, if you focus on getting things done in a systematic way, you’ll start to check things off your list in no time! 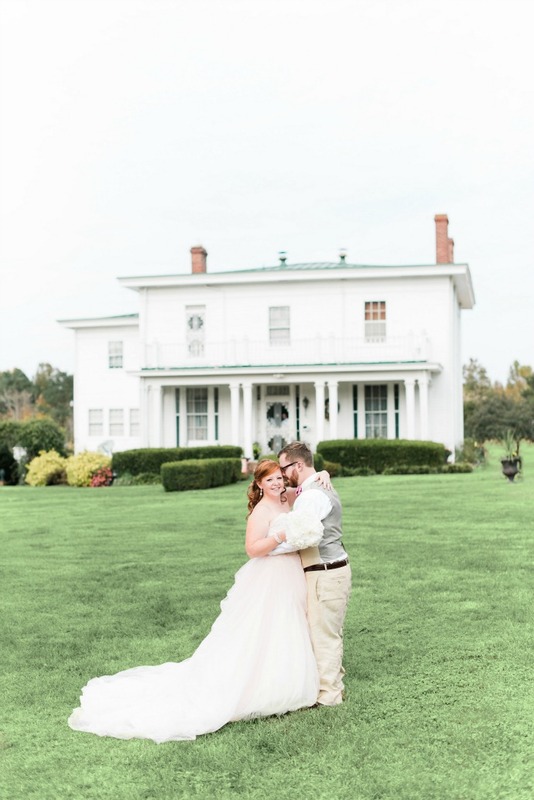 At Dellwood Plantation, we have everything you need for the wedding of your dreams including our pristine gardens, rustic barn and stately manor house. We’d love to invite you over for a visit and a tour of our venue. Contact us today for more information on our available packages, pricing and to set up a tour today. September is a beautiful time for a wedding and that couldn't be more true than the gorgeous day Katie and Robby had here at Dellwood during Labor Day weekend at the beginning of the month. The sun was shining and there was nothing but blue sky for miles which went perfectly with Katie and Robby's sunflower and blue wedding. We were especially excited to share these photos with you as Katie and Robby set up their ceremony site in front of our barn. Call us biased, but we happen to think that the barn looked amazing as the backdrop for these two as they said their vows and became husband and wife. We hope you enjoy a glimpse into Katie and Robby's big day at Dellwood! Enjoy! Isn't this idea for a "Family Tree" just the cutest?! Congratulations to Katie and Robby! We couldn't be happier that you chose to start your life together at Dellwood. We wish you many years of love and happiness in your marriage! According to Southern Weddings, the southern tradition of the bridal portrait most likely started prior to World War II it was rare for a photographer to attend a wedding, so bridal portraits would be taken in a photographer’s studio prior to the wedding. While the traditional studio portraits are becoming a thing of the past, the tradition is still very much in style for today’s modern brides. We’ve had our fair share of gorgeous bridal portraits taken here at Dellwood over the years, so we wanted to share a few tips for brides planning for bridal portraits. Since you are most likely planning a hair and make-up trial, schedule the trial for the same day so you can give yourself a full trial run of the look you want for your wedding day – the dress, the shoes, the jewelry and the flowers. Not only will you get an idea of your full bridal look, but you’ll get an idea of how easily you’ll move in dress and how it feels to carry your bouquet. Understanding your personal style and the "look" you want in your photos is very important to discuss with your photographer. Are you going for rustic? Vintage? A little bit of both? Talk through the options with your photographer and decide on locations that will work best for your vision. Not sure the style you want for your bridal portraits? Check out our Pinterest board for bridal portrait inspiration. While you may have a Pinterest board with various poses and looks you want, your photographer has years of experience to help you look your best. Be sure to work with your photographer to not only convey your ideas and vision for your bridal portraits, but also be open to multiple angles and locations. Also, be open to trying something a little different – that might get you your favorite photo! Most importantly, just be yourself! Do not be afraid to let your personality shine through with different poses or photo locations that show your true personality. We couldn't help but include this amazing photo of Priscilla in the tub in the bridal suite - now she looks like a girl who is up for anything! Photos like this will be treasured for years to come and be great conversation pieces with family, friends and future generations to come. Do you have any bridal portrait advice you'd like to share with future brides? Did you take bridal photos or not? We'd love to hear your thoughts, so please leave a comment below to share with new brides-to-be!